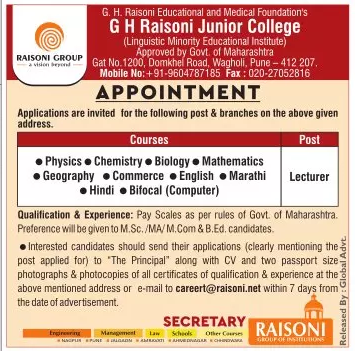 G H Raisoni Junior College, Pune has advertised in LOKSATTA newspaper for the recruitment of Assistant Professor job vacancies. Interested and eligible job aspirants are requested to apply with in 7 days. Check out further more details below. About College: G H Raisoni College of Arts , Commerce & Science a modest beginning by Late Shri. Gyanchandji Raisoni with a philanthropic objective in 1984…. Raisoni Group has traded into the world of education with the motto of “VISION BEYOND” for Enlightening Minds & Empowering Ambitions, a glorious history of 4 decades….a conglomerate of Institutions … Raisoni Group has developed sky-scraping structures, great infrastructure and impeccable records…. A modest beginning by Late Shri. Gyanchandji Raisoni with a philanthropic objective in 1984…. Raisoni Group has traded into the world of education with the motto of “VISION BEYOND” for Enlightening Minds & Empowering Ambitions, a glorious history of 4 decades….a conglomerate of Institutions … Raisoni Group has developed sky-scraping structures, great infrastructure and impeccable records.